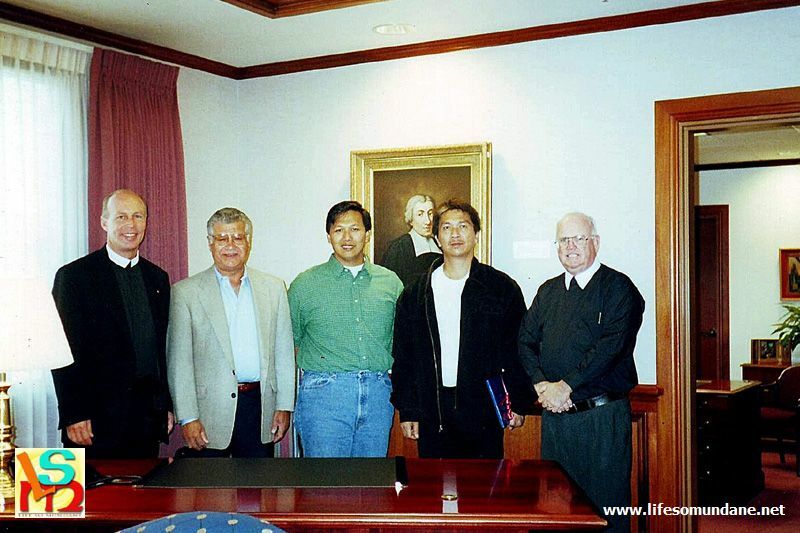 Arnold Capuloy and I at the Office of the President, St. Mary's College of California. In the previous decade, the school where I used to work enjoyed a great partnership with the St. Mary’s College (SMC) of California, a school similarly run by the Christian Brothers in the United States. The American school would annually sponsor immersion visits of administrators from my school for them to learn best practices which, it was hoped, could be applied when they returned. In return, the American school would, when it needed to, send across its own faculty and students to conduct training seminars or learn about the school system in the Philippines. The exchange program was initiated through the efforts of the late Br. Rafael Donato and his good friend Br. 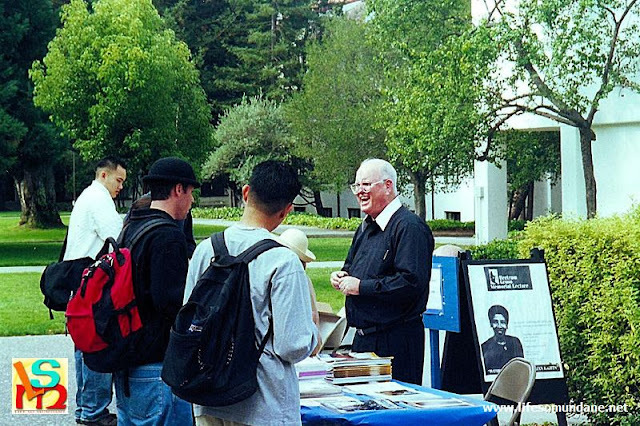 Brendan Madden, who used to be assigned to the Philippine Province but was then a member of SMC’s administrative and teaching staff. I and a colleague, Arnold Capuloy, were the first two beneficiaries of the program from the Philippine end. We were both from the administrative side of school operations and flew out to the United States in the year 2000 to be hosted by our counterparts at SMC. The arrangement was simple. SMC being the wealthy American school, it paid for our fare across the ocean and billeted us at the Brothers’ community. Interviews with office administrators were arranged for us during our stay; and from these, it was hoped, we would learn the college’s best practices. 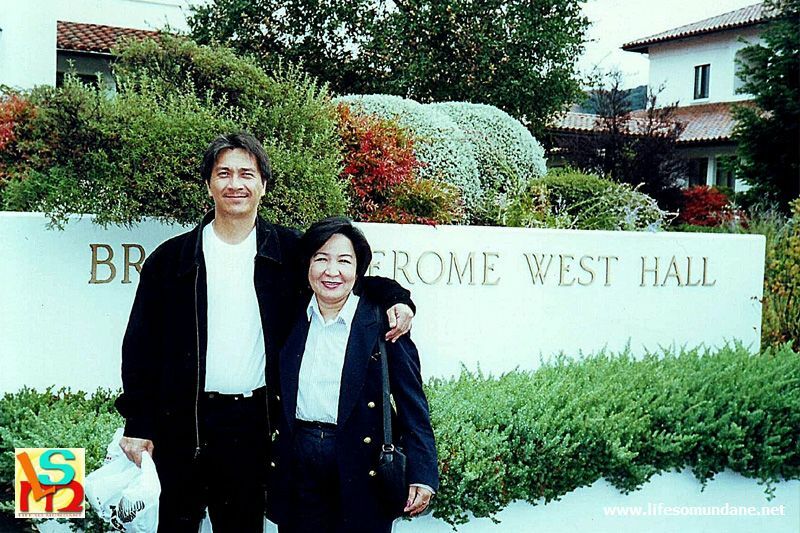 Posing with a Filipino-American employee of St. Mary's College of California. 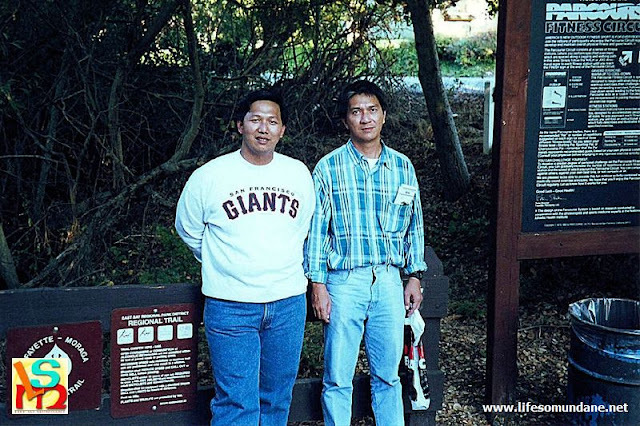 In our free time, we attended social functions if there were any or went out to see a bit of the country with alumni or Filipinos we met while we were at SMC. For some reason or the other, the Filipinos we came across – even those we only met there – were all eager to socialize with fellow Pinoys who had just come from across the pond. Living with the American Brothers was no problem. Most of them were at least casually friendly and we came to know some of them very well. There were a few who had been assigned to the Philippine Province. Since there was already something to talk about from the off, it was these Brothers who we came to know better than the others. There was, however, this Mexican-American Brother who was hostile from the very beginning. Arnold warned me about him as soon as I arrived. We were, in a manner of speaking, his guests. So, I was prepared to be at least civil towards him whichever way he acted towards me. Besides, it was a large enough school and, therefore, it was not as though I would see an awful lot of him. Although it was one school, there were actually two communities of Brothers. I will not attempt to explain because, to this day, I cannot say that I fully understand why. At any rate, for breakfast and lunch, we dined in this large hall with Brothers from both communities. These meals were always interesting because the Brothers were themselves interesting personalities and loved to banter with each other. Sometimes, I would just listen to the repartee and laugh along with them. Other times I would engage in conversations with whoever was willing. There was this Vietnamese Brother who was bordering on senility and whose English was limited and went on forever about the Philippine President at the time as “very good!” He was talking about Erap. There was this other Brother who sat quietly stooped in front of his meal hardly talking to anyone. One morning I tried to start a conversation and to my surprise, once he got started, I could not get a word in! But each and every morning, the Mexican-American Brother that I was warned about remained, if not openly hostile, then at least aloof and anti-social. If I tried to talk to him at all, he would not even look at me and mumble something curtly under his breath as a reply. It was all the motivation that I needed. On the rare occasions that I met him along the corridors, I would make it a point to beam my brightest smile at him and loudly greet him whether he responded or not. Sometimes he would mumble something unintelligible; other times he would just curtly nod his head. Each time he would not even look at me. One night two days before we were due to fly back home, Arnold and I helped ourselves to some softdrink in the kitchen upstairs. Arnold said it was alright; he had been told to help himself to whatever he needed. As we were snooping around, we came upon a tiny handwritten note pinned to a corkboard on the wall. Eavesdroppers, they do say, hear ill about themselves. While we were not exactly eavesdropping, we landed more or less in the same predicament. Br. Brendan Madden FSC (right) was a frequent DLSL guest and was our host at SMC. The note was an unsigned complaint about Brothers who let their personal guests stay in the community, especially with regards to the impact of the cost of the guests’ stay on the community’s budget. While we were official guests of the college, we were also in essence personal guests of Br. Brendan. Although the note was unsigned, we did not have to be Sherlock Holmes to know who wrote it. It was so unnerving to have stumbled upon it! It had been such an idyllic visit for both Arnold and I; and the last thing we needed was for something like this to spoil it just when we were about to fly out. The next day, just so Arnold and I would not have to join the Brothers for supper, we walked five miles to the town of Moraga’s small commercial center to buy fastfood to take to our rooms. Since we were flying out the next night, we did not want to aggravate anyone, even Brother Scrooge. When we were back in Lipa, naturally, we told Br. Rafael about the incident. Arnold had the good sense to have the note photocopied. Br. Rafael, who was the epitome of hospitality, could only shake his head after he read the note. Arnold and I posing at the park near St. Mary's College of California. We also told Br. Brendan the next time he came over for a visit. Months later, he told us that he took the matter up with the Mexican-American Brother. The note, he was told, was not so much about us but rather the guests of another Brother who stayed in the community just before we arrived. Probably. But he still could have waited until after we had left before posting the note; not while we were there. Or better still, he could have brought the matter up when they had their community meetings. What were we supposed to think; and particularly after he had gone to great lengths to make us feel so unwelcome? There were a few more administrators who flew out to California after us. Fortunately for them, none got the same treatment from the same Brother. Years later, I learned that he had passed away. That’s too bad, I thought. If there was one Brother who I wanted to fly over from SMC, it would have to be that Mexican-American Brother. I would have gone out of my way to make sure that he had a memorable visit just so he would learn how to treat his guests better.